Armenia may give up occupied Azerbaijani territory in near future according to Turkish President Abdullah Gul who says he “sees new opportunities for settling the conflict in Azerbaijan's breakaway province of Nagorno-Karabakh”. The Turkish leader made the comments after both Armenia’s capital Yerevan and Azerbaijani capital Baku. A settlement of the long running conflict could enable the region to play a more prominent role in energy transportation projects with Gul stating “If the mood of cooperation prevails in the region over hostility, it will serve the interests of all countries in the Caucasus,” and noting that the Armenian and Azerbaijani leaders are on good terms with each other. On September 6 the Turkish president spent several hours in Yerevan at the invitation of his Armenian counterpart Serzh Sargsyan, attending the qualification match of the 2010 FIFA World Cup between Armenian and Turkish teams. It was the first visit by a Turkish head of state to Armenia for more than 70 years. Armenia is striving to secure worldwide recognition of the 1915 Genocide by the Ottoman Turks. Turkey abandoned diplomatic ties with Armenia upon its declaration of independence from the Soviet Union in 1991. 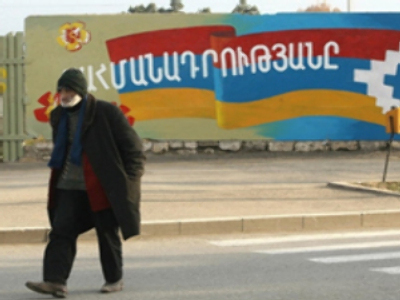 The border between the two countries was then shut by the Turkish government, when the Nagorno-Karabakh crisis erupted in the region. While both sides express their commitment to a peaceful solution, it is yet unclear what form this could have. In the wake of recent events in Kosovo, Abkhazia and South Ossetia, recognition of the de facto independence of Nagorno-Karabakh (or Artsakh as its citizens prefer to call themselves) can’t be ruled out. Map of Nagorno-Karabakh (Artsakh). 'AZ' marks areas controlled by Azerbaijan. Territorial ownership of Nagorno-Karabakh (Artsakh) – a region that is inhabited mainly by Armenian population – is a heavily disputed issue between Armenia and Azerbaijan. Having been under the control of various empires which have held sway in the area since the Assyrians in 800BC, the region began the 20th century as part of the Russian Empire. Following the Bolshevik revolution it became a scene of a series of brutal conflicts between 1918-1922. The violence subsided only in 1922, when a friendship treaty made Turkey and the Soviet Union guarantors of peace in the region, which soon became an actual part of the USSR. When glasnost was declared by Soviet leader, Mikhail Gorbachev, in 1985, leaders of the Regional Soviet of Karabakh voted in favor of unifying the autonomous region with Armenia, claiming that Azerbaijan had attempted to ‘Azerify’ the region. Gorbachev flatly refused a border change, fearing it would set a dangerous precedent. Soon after, ethnic infighting began both in Nagorno-Karabakh (Artsakh), where Armenians evicted many Azeri, and in other parts of Azerbaijan, where dozens of Armenians were killed and thousands forced to migrate. Similar skirmishes followed in Armenia soon evolved into a full-scale war in the region. Despite a considerable advantage, in terms of military personnel and arms, on the Azerbaijani side, by the time a 1994 ceasefire was signed Armenian forces controlled not only most of the Nagorno-Karabakh (Artsakh) but also some 14% of the rest of Azerbaijan’s territory. But Armenia may be ready to give up Azerbaijani territory it is occupying according to the Turkish leader. Another major result from Gul’s visit to Yerevan was agreement on the resumption of power deliveries to parts of Eastern Turkey, which were halted after the collapse of the Soviet Union. Deliveries through power transmission lines via the city of Kars – idle since early 1990s – are expected to resume in the near future. An agreement with a price of $US 0,057 per kWh has been signed between the two state energy companies. “Cooperation between the two countries in power supplies has been agreed upon at the top state level,” Armenian Minister of Energy and Natural Resources Armen Movsesyan told Itar-Tass.